What would the world be without pudding, especially if it is a chocolate one! Puddings are the most easy desserts to make and this is an opportunity for you as a cook, to make sensational desserts in no time! Knowing how to make pudding from scratch is like winning the Oscar for desserts. You may be wondering what petimezi (epsima in Cyprus) and charoupomelo (teratsomelo in Cyprus) are. Petimezi or epsima is grape juice, cooked until a thick syrup is produced. It’s a product produced for millennia and you may already know it as grape syrup or grape molasses. Charoupomelo, is the syrup taken from the carobs. These two Greek traditional products were used in the old days as sweeteners but I have been experimenting with these products to make something more contemporary, combining them with chocolate. I’ve written about these two products many times and you can find a lot information in the links I provide below. A few weeks ago I bought some fresh grape juice (must) from the farmers’ market in Nafplion. This is used to make a pudding called “Moustalevria” in Greece and “Palouzes” in Cyprus. However, apart from the traditional recipe, which I love, I wanted to experiment and make some new ones. I reserved some grape must which I combined with chocolate. The second time I used some milk and if you want a richer cream you can add heavy cream. After seeing the amazing results, which were easy and quick to make, all of them were delicious and some can also be classified as healthy desserts, I have a few more ideas how I will be using them in the future. Put the flour and corn flour in a bowl and add water and milk and mix until it is dissolved. Put the grape must in a pot as well as the dissolved flour and using a balloon whisk, mix until it begins setting. Add the chocolate and mix until it melts. At boiling point the cream is ready. Transfer into molds. When it cools refrigerate for a few hours before serving. Sprinkle some cinnamon on top. Serve with quince preserve or jam. In the second recipe I did not use grape juice but instead I used only petimezi, which I diluted in water. However, instead of water you can use milk. You add petimezi and water or milk and mix it until it is sweet enough to your taste. For this recipe we need three cups of diluted petimezi and water. Personally I used 3/4 cup petimezi and 2 1/4 cups of water. I did not want the pudding very sweet as I like serving it with some fruit preserve (glyko tou koutaliou) or jam on top. This time I scented it was rose. I used rose water, rose liqueur, another traditional, local product from Karonis distillery in Nafplion and dried rose petals, which my daughter had gifted me some time back. Put petimezi, water, rose water and corn flour in a pot and stir until the corn flour has dissolved. Put it on the heat and add salt and pepper and mix with a balloon whisk until it sets. Remove from the heat and add the chocolate and butter. Mix until the chocolate melts. Wet the molds with the liqueur and any leftover pour into the chocolate mixture and mix. Divide the mixture into six molds. Wait until it cools and refrigerate. Unmold and serve as it is or with chocolate syrup or with quince or other spoon preserve. In this recipe, instead of using petimezi, I used charoupomelo (carob syrup). This is another traditional product which I love and have used it in cakes, in cookies etc. I’ve been using this product for years and you can find more information about it here. Put the diluted carob syrup, flour and corn flour in a pot and stir until the flour has dissolved. Divide the mixture into 3 -4 molds. Unmold and serve as is or with carob syrup on top. 1. Petimezi and Charoupomelo are diluted in water, juice, milk, Greek or other coffee (for a mocha flavour) or heavy cream until the desired sweetness is achieved. In my recipes I do not make it too sweet. 2. For every cup of diluted syrup, we need 20 grams (or a heaped tablespoon) of corn flour (starch) or all purpose flour or a mixture of both. 3. Butter is optional but it adds to the taste and make the cream shiny. You can substitute with vegan butter or margarine to make the dessert vegan. 4. You can add any type of chocolate you like but a good quality chocolate is advisable as it will make the dessert much tastier. Add vegan chocolate, such as couverture chocolate to make it vegan. 5. Salt and pepper: salt enhances the flavour to anything we make. Pepper pairs well with chocolate. 6. All three recipes can be made vegan by using couverture chocolate, water instead of milk or cream and margarine instead of butter. 7. Any liqueur can be used but if you do not want to use alcohol, you can wet your molds or bowls with rose of blossom water. This helps them unmold easily. I am not going to give you the exact ingredients for the last recipe because you can “Give a man a fish and you feed him for a day or you can teach a man to fish and you feed him for a lifetime”. With the instructions given above, I believe that if you try you can make your own pudding. This last recipe was made just a while ago but when I finished I literally licked the bowl and it was so delicious. The weather is cold, rainy, gloomy and windy but I managed to take this shot outside. If there is any leftover by tomorrow, I hope to get a better shot. In this recipe I used heavy milk and egg yolks. I did not add butter as the dessert is already rich with the above two ingredients. I added less corn flour as the eggs will also help set the cream. 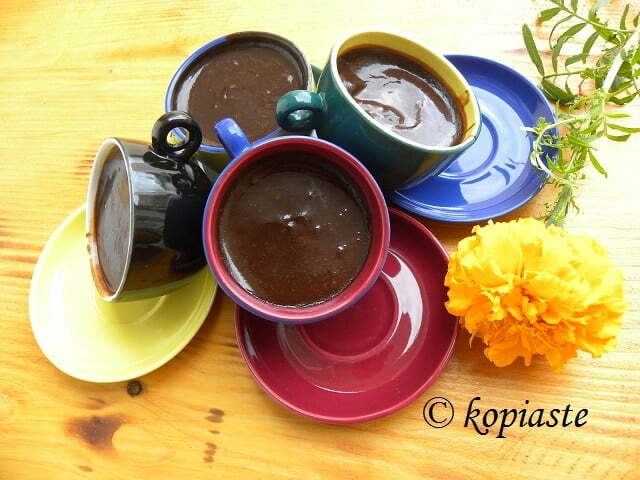 The same recipe can be made with petimezi or carob syrup. With petimezi it has a slightly sour taste and with charoupomelo, it has a more chocolaty taste. You can understand that the richer the ingredients the more delicious the pudding gets, so make your own decisions and add what you like best! This time the pudding was cooked over a water bath in order to avoid burning the cream with the chocolate. Put the heavy cream, petimezi and cherry liqueur (after wetting the cups) in a metallic bowl. Add the corn flour and mix until it dissolves. Put it in a water bath and mix with a balloon whisk until the cream is hot. Add the chocolate, salt and pepper and mix until the chocolate melts. Add the egg yolks and whisk quickly so that yolks will not be cooked. Serve in small cups, hot or cold. What’s next? I’ m thinking of Panna Cotta! Put the heavy cream, petimezi (grape syrup) and cherry liqueur (after wetting the cups) in a metallic bowl. Add the corn flour and mix until it dissolves. Your chocolate puddings all look marvelous, Ivy. Did you make your own grape must? Thanks Angie. Unfortunately no. If we produced grapes I would love to make it myself but it is sold everywhere year round. Bienvenuta al mio blog. Grazie Tamara. Wowee Ivy, what an experiment! And lucky you for having all these delicious chocolate puddings to eat! Kudos to you! And they are beautiful!